U.S. millennials and Gen Zs aren’t entirely replacing their Snapchat addiction with Instagram Stories, according to a dozen studies and surveys commissioned or collected by TechCrunch. Yet the fact that 80 percent of Instagram’s users are outside the U.S. has helped propel Instagram Stories’ rapid ascent to 200 million daily active users last month, surpassing Snapchat’s 158 million users from Q4 2016. That could make it tough for Snapchat to significantly reverse its declining user growth rate as teens around the world who aren’t already on it may get their storytelling needs met on Instagram. Facebook’s family of apps has failed to strike a fatal blow to Snapchat, but could still hinder its user growth, forcing Snap to focus on increasing time spent in its app and average revenue per user to expand its business. Facebook launched the first shots of its all-out war on Snapchat in August, when Instagram prominently added a new feature above its feed. Instagram Stories is an exact clone of Snapchat’s 24-hour ephemeral slideshow Stories feature. At the time, we predicted that Snapchat loyalists would hold firm, but Instagram Stories’ convenient design in an already popular app and the existing social graph people had built there could make it good enough to deter new users from joining Snapchat. In January, we issued our report that analytics companies and social media celebrities had seen a significant drop in Snapchat Stories views due to the launch of Instagram Stories and the removal of Snapchat’s auto-advance feature that automatically chains together friends’ Stories. It seemed likely that the competition and product change would lead to a decline in Snapchat growth rate. A week later, when Snap Inc. filed to IPO, we learned that Snapchat’s growth rate had declined 82 percent since the launch of Instagram Stories. It gained just 5 million users in Q4 2016, to hit 158 million users. Clearly Instagram was having an impact on Snapchat’s future, but the question was whether it would significantly rob Snap of its core U.S. millennial user base. That’s what we sought to determine with today’s collection of data sources. Data suggests that Instagram has caused a decrease in usage of Snapchat, but that the startup is far from dead. Analytics firm SimilarWeb found that the percentage of all Android devices with Snapchat installed peaked at 25.29 percent in October, shortly after Instagram Stories launched in August. That percentage has declined slightly, to around 23.5 percent. The percent of U.S. Android users who are daily active Snapchat users peaked in May 2016 before Instagram Stories launched, and has declined roughly 11 percent since then. Snapchat has managed to increase time spent on its app 7 minutes, or 45 percent, over the past 18 months. But its swift growth rate turned into a decline after Instagram Stories launched, sinking from roughly 22 minutes before to a low of 19 minutes and 27 second after. Snapchat is now growing again and is currently at roughly 24 minutes. 7Park Data found that the number of Snapchat user sessions declined significantly among users who started using Instagram Stories. It also found the number of daily active Snapchat users declined faster amongst Instagram Stories users, according to the 14,000 people it studied. The launch of Facebook Messenger Day did not have the same impact on Snapchat. Marketing analytics platform Captiv8 sees 57% of social media influencers posting more on Instagram than on Snapchat each day. Snap saw more influencer posts in the beauty and traditional celebrity categories, while Instagram was more popular amongst comedy and lifestyle influencers. Analytics firm Jumpshot found that the launch of Instagram Stories did not noticeably impact the share of email signups between Instagram and Snapchat at first, with Snapchat holding steady at around 76 percent. But as Instagram Stories gained steam by the end of 2016, Snapchat’s percentage shrank to 64 percent. eMarketer estimates that Snapchat’s revenue growth will decline significantly in 2017 and 2018. It grew 492 percent from 2015 to 2016 when it hit $340 million in ad revenue. Revenue is projected to hit $895.5 million in 2017 as the rate drops to 163.3 percent, and $1.7 billion in 2018 with the growth rate falling to 90 percent. Still, 90 percent is a solid growth rate, and the decline is to be expected as Snapchat’s business matures. 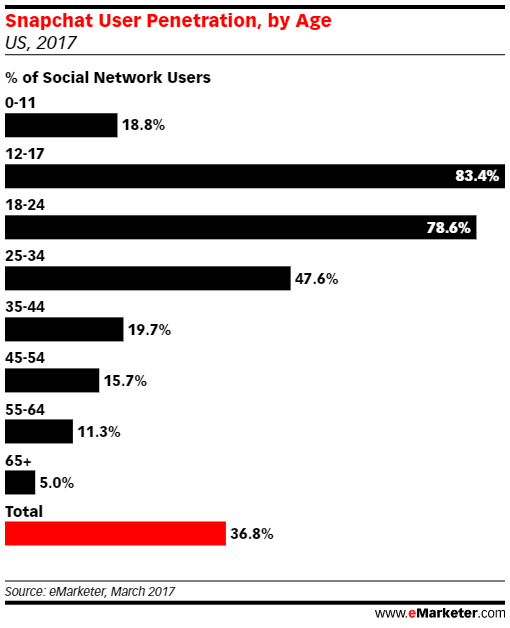 eMarketer did find that Snapchat has a massive 83.4 percent penetration rate amongst 12 to 17-year-olds in the U.S. This data suggests that Instagram has made a dent in Snapchat, slowing its growth and making it a second choice behind Instagram for some brands. But surveys of Snapchat loyalists show a strong preference for the cool startup over the Facebook acquisition. Mobile story game maker Episode surveyed 10,000 of its users who are mostly women age 13 to 25, and found that 69 percent say their Snapchat usage hasn’t declined at all since the launch of Instagram Stories, while 22 percent say their usage has declined slightly and only 9 percent say it’s significantly declined. Analytics provider App Annie found that Snapchat hosts an exclusive audience that often can’t be reached by advertising on other platforms, as previously reported by Bloomberg. On any given day in the U.S., 35 percent of daily Snapchat users can’t be reached on Facebook, 46 percent can’t be reached on Instagram and 58 percent can’t be reached on Messenger. Brand ambassador network Heartbeat surveyed 1,700 13 to 20-year-olds out of its 103,000 users; 74 percent said they still post more on Snapchat, 60 percent said they post to their Snapchat Story every day compared to just 18 percent on Instagram. However, they say they average 2.5X more views on Instagram Stories than Snapchat. Asked which of the two apps they’d take if they could only have one, 51 percent said Snapchat while 49 percent said Instagram. Seventy-seven percent said ads were more relevant on Instagram, but only 19 percent thought their Snapchat Stories views have declined since the launch of Instagram. Consumer insights platform Whatsgoodly surveyed 1,991 millennials in April and 1,106 in November. It found that Snapchat was overwhelmingly preferred over Instagram Stories, but the percentage that picked it fell from 88 percent in November to 78 percent in April. Mobile ad company Kiip surveyed 10,000 users; 37 percent said their use of Snapchat declined since the launch of Instagram Stories, and 59.6 percent said they preferred Instagram Stories over Snapchat Stories. However, when asked which feature of Stories they find most important, Snapchat’s animated selfie filters were most popular, with 38.2 percent, followed by Instagram’s Live broadcasting feature with 31 percent. They surveys indicate that millennials and Generation Z millennials may still be staying loyal to Snapchat. They might have a larger network on Instagram, and they might already be using Instagram’s permanent feed. But these early adopters of Snapchat developed an ingrained behavior of opening and posting to it daily. As Snap Inc reports its first earnings results after going public, expect it to highlight metrics that show off this loyalty, like minutes spent per day, video views, revenue per user, and percentage of users who post to Stories — anything other than DAU that might look weaker. While people new to the Stories format might find Instagram more convenient, Instagram hasn’t created a compelling enough reason for die-hard Snapchatters to switch.